Facebook applications are notorious for spamming and (sometimes) scamming users. We are in the process of compiling a “blocklist” of apps that should be avoided if you want to minimize the spam on your News Feed. We aren’t saying any of these applications are scams or doing anything to violate Facebook’s ToS, they are just considered annoying and/or spammy by some users. You can visit the links below for each application and click the “Block App” link located in the bottom left hand corner. This will keep you from receiving the annoying notifications and updates from that app. 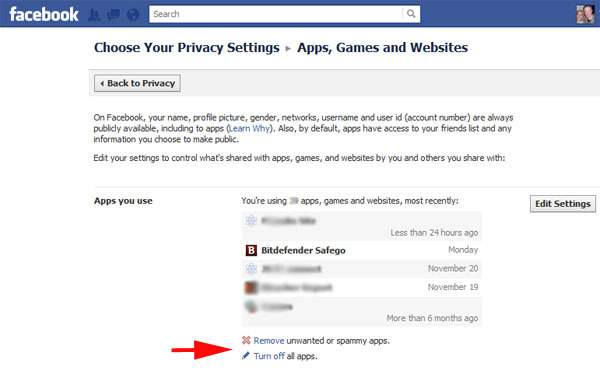 ***As of February 1, 2012, Facebook is removing Application Profile Pages. We have found it difficult and sometimes impossible to locate block links for some Facebook applications. What car will u drive??? What should your hair color be? Searching… – (Please report this app – It has been used as a Profile Peeker and ‘Time on Facebook’ rogue apps. Are you Anegl or Satan? We also recommend that you use Bitdefender Safego, a third party Facebook application made by a legitimate and well known developer – Bitdefender. This app will scan your news feed and help keep you safe from many of the scams we warn about.